Be sure to purchase the Inside the Pylon Draft Guide (including team specific guides) for full reports on all drafted players, available now! After a heartbreaking 15-10 loss to the eventual Super Bowl champion Philadelphia Eagles in the NFC Divisional Playoff round, the Atlanta Falcons have plenty to look forward to. General manager Thomas Dimitroff and head coach Dan Quinn have done a phenomenal job of forming an identity and building the team around the culture they have developed since Quinn came over from the Seattle Seahawks in 2015. Over the past three seasons, each draft class has included and solidified pieces of the teams foundation and formed a solid nucleus. Drafting Deion Jones, Vic Beasley, Grady Jarrett, Keanu Neal, Tevin Coleman and Takkarist McKinley in that span, the team has a proven formula of finding talent all throughout the draft. After drafting so well from 2015-2017, the foundation of the team was already intact. It was now time for the organization to build depth at certain spots and prepare for the future. There really wasn’t any need to find any immediate starters through the draft. With Taylor Gabriel leaving via free agency for the Chicago Bears and 2015 fourth-round pick Justin Hardy still yet to top 250 receiving yards in a season, there was a hole at the No. 3 spot behind Julio Jones and Mohamed Sanu. The team arguably had more pressing needs than receiver, especially at defensive tackle and guard, but they stayed true to their board and selected the best player available in the first round. “We’re really excited to add him as another firepower weapon for us, and he’s going to mix in very well with our offense,” Dimitroff said in his press conference following the first night of the draft. 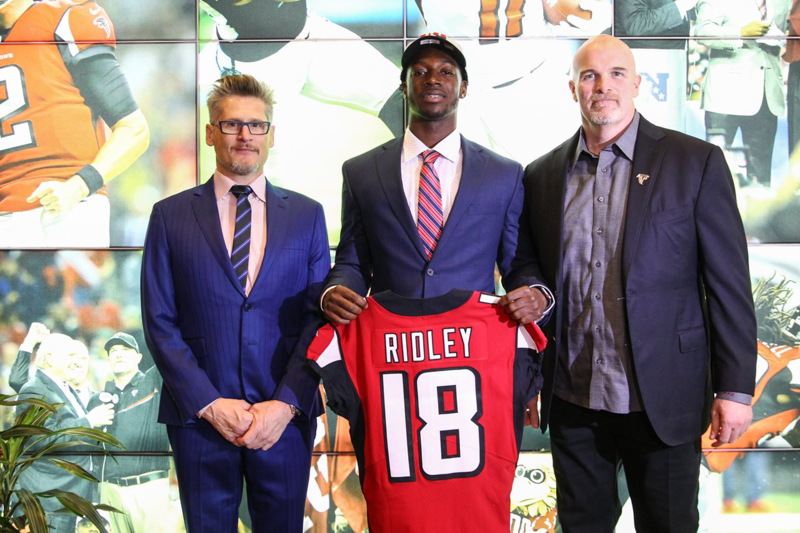 Adding Ridley to the receiving corps solidifies their depth and gives them a young option going into the future amid contract concerns with Jones and Sanu having an opt-out in his contract following next season. The team has big plans for the former Crimson Tide product in their offense. “You want to see guys that can beat man-to-man and have that type of quickness,” Quinn said. “Only a few guys have the speed to play outside but the change of direction to play inside. Really equipped guy, you can tell he’s been really well coached. Rock-solid guy and ready to contribute right away.” The team seems to have big plans for Ridley right away in Steve Sarkisian’s offense. Long, press man-to-man cover cornerbacks have always been known as what Quinn loves at the position. The ability to run and stay stride-for-stride with receivers in phase and having adequate ball skills is an added incentive. Isaiah Oliver was the perfect match for the team and defensive scheme. Throughout the draft process, his strengths were length (6-foot, 201 pounds), speed and polished technique. His overall technique was arguably the best of the class and there were many who considered him a first-round pick. Getting him in the back-end of the second-round was terrific value for a team that needed to add depth in the secondary. The team is set with Desmond Trufant and Robert Alford, but if his development stays on track, Oliver could challenge to be the No. 2 corner in the near future. After Dontari Poe signed a three-year, $28 million deal with the Carolina Panthers this offseason, there now was a huge void at the 1-technique spot next to Grady Jarrett on the defensive line. The 2018 draft class was known as one that was deep along the defensive front. There were a lot of headliner names and many expected the issue to be addressed early on, but Dimitroff waited until day two to fill one of the teams most glaring holes. After having success with a fifth-round pick in Jarrett, whose draft fall was based solely on him being undersized, the team opted to go in a similar direction with Senat. At 6-foot-0, 314 pounds, Senat was another prospect that was considered undersized and slipped because of it. He has the positional flexibility to play both the 1-technique and 3-technique spots, which is now vital with the loss of Poe. On May 11, the team signed defensive tackle Terrell McClain to a one-year deal. Alongside Senat, the two are sure to split the reps that Poe occupied a season ago. Devonta Freeman and Tevin Coleman make up one of the most formidable backfield duos in the entire league. Prior to last season, Freeman signed a five-year, $41.25 million extension. With that already on the books and with Coleman entering the final year of his rookie contract, it seems like a foregone conclusion that he’s playing his last season in Atlanta. Smith will already be entrenched as the heir apparent to Coleman after a year in the system and ow with Coleman’s departure, he will receive an increased role behind Freeman. Smith is not the consistent home-run hitter that Coleman is, but he potentially can serve as a really nice complement to Freeman. His production at Southern Mississippi speaks volumes, as he rushed for 4,500 yards and totaled another 1,400 receiving. A late bloomer in the process, Gage was a relatively unknown until NFL Network draft analyst Mike Mayock included the former LSU receiver as the No. 99 overall prospect in the final list of his top-100 draft eligible players. Having served as a defensive back in his first two seasons in Baton Rouge, Gage made the switch to receiver in 2016. His production has been minimal and most of his contributions have been on special teams. That seems to be where he will serve early on during his career because he’s still adjusting and learning how to play the position. The team’s final pick in the draft was used on a bit of a project in Oluokun. One of only two Ivy League players drafted, Oluokun flew under the radar during the pre-draft process. It wasn’t until he had a successful pro day at Fordham University, where he ran an impressive 4.48 40-yard dash time. His film doesn’t wow you, nor are his stats eye popping, but with his athletic mold and testing numbers, there was bound to be a team that took a chance on him in the later rounds. With a team that’s very deep at linebacker, and Oluokun only being 6-foot-2, 215 pounds, the team may opt to move him to safety because his measurables aren’t good enough for him to sustain at linebacker. He’s a long-shot to make the team, but if he does, it would most likely come as a special teams role player or a further down-the-line depth piece in the secondary. Follow Jordan on Twitter @JReidDraftScout. Check out his other work here, such as his recap of the Indianapolis Colts’ draft.